P-80 Grip-it is a truly unique multifunctional product designed specifically for the assembly of rubber articles. Not only does P-80 Grip-it have impressive lubrication, it provides adhesiveness for the mated parts. P-80 Grip-it delivers those benefits using a proprietary, water-based technology that further offers excellent rubber compatibility, ease of use, and no danger to employees. Whenever a rubber article is manipulated, assembled, or installed, the use of a proper lubricant is crucial. Traditional oil lubricants can lead to swelling, softening, twisting, or slipping of rubber after assembly. Soap and substitute lubricants lead to rolled, torn, misaligned, or partially installed parts. P-80 Grip-it solves this problem by delivering a thin, lubricating film over the inherently water-repellent rubber surface. The film allows for easy and proper assembly – reducing friction on average by 40%. P-80 Grip-it’s properties continue to work after the parts are installed. As P-80 Grip-it dries, its film becomes tacky which helps the parts remain attached. This process can occur in as little as 15 minutes. Since P-80 Grip-it is water-based, it cannot be over-applied. Moreover, P-80 Grip-it has no health, physical, or environmental hazards. 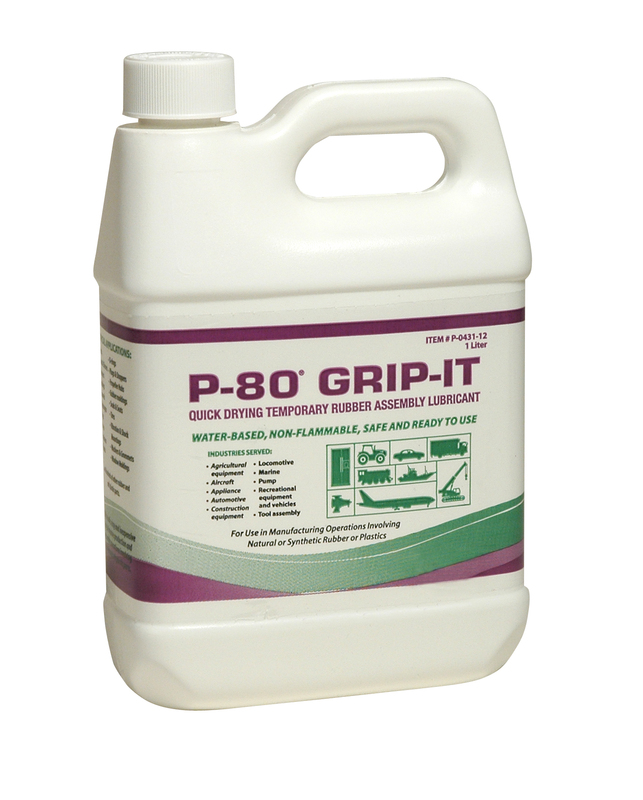 An independent toxicological laboratory tested P-80 Grip-it and found it to be a non-hazardous product. P-80 Grip-it is part of the P-80 product line that was awarded the 2012 Frost and Sullivan Product Leadership Award for automotive assembly lubricants. P-80 Grip-it serves other industries including appliance, marine, aerospace, pumps, and recreational and sports equipment. P-80 lubricants are manufactured by International Products Corporation headquartered in Burlington New Jersey – USA. View the entire line of P-80 lubricants at http://www.ipcol.com. Free samples are available for testing.